The first season of one of the hottest and most imitated shows on cable finally makes its way to DVD. What could possibly be lurking in that box in this abandoned storage locker? Who doesn't love a treasure hunt? 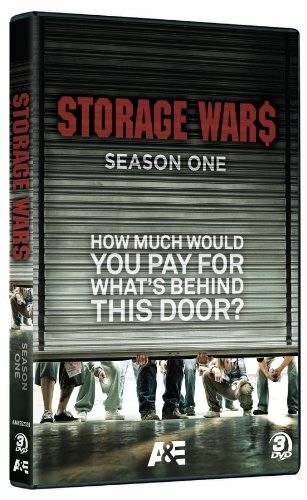 Storage Wars and its success seems to have taken everyone, the participants included by surprise. The program is based on the fairly goofy concept of following around four guys who bid on abandoned storage lockers in hopes of finding valuables that will allow them to turn a profit. There's a fairly set formula: the four (usually, though sometimes one is missing) and anyone else who's interested come to the storage facility where the auction is to be held, auctioneer Dan Dotson opens the unit and allows them five minutes to look around before starting the auction for cash, with everything to be removed in 24 hours. The rub is they can't go in, they can't touch anything, they can't open any boxes before they bid. It's a clever setup that encourages high bidding for what may well end up being someone's dirty laundry or unopened mail. And it also pays off handsomely at times, as treasures and even cash are forgotten in these abandoned lockers. That premise is a good start, and that might be enough to hold the viewer's interest as we're curious to see what was left behind, and what these folks of varying experience are able to identify as worthwhile amongst all the detritus. But what makes the show really compelling and entertaining, and sets it apart from its many shameless imitators, are the characters and their relationships. At the center of everything is the rivalry between resale mogul Dave Hester and competitor Darrell Sheets, who operates out of his home. These guys genuinely can't stand each other, and they miss few opportunities to stick it to the other, whether by practical jokes that get out of hand or running up the bid on the other fellow. The two less experienced participants are even more fun to watch. Jarrod Schulz starts out showing up alone as he tries to stock the shelves of his resale store, but before long his wife Brandi has enough of him spending too much on worthless lockers. She then starts to take an active hand in the bidding and assessment of the lockers, and more often than not turns out to be right, rankling Jarrod. Their interplay and their relationship is a lot of fun to watch, especially as they good-naturedly give each other grief (though Jarrod on occasion does go too far). The fourth main player is Barry Weiss, a retired produce merchant who has been active in collecting antiques for 45 years. His dry wit and sarcasm provides plenty of laughs throughout the series. Even if you've seen the series before, there is still plenty of replay value in revisiting episodes for the interpersonal jabbing and to catch things that went by too fast originally. Every commercial break starts at a mini-cliffhanger, so it's very nice to be able to go right to the next section without waiting for A&E's interminable advertisements. The series doesn't spend any time focusing on the dark underside of the show: what happened to the people who left these things in storage? Why didn't they pay the rent on the unit that had all these valuable in it? Who puts cash into a storage unit, anyway? With the economy in the toilet, there will probably be no end to such lockers being abandoned rather than paying the rent. In a way, the show and its participants could be considered profiting from the misfortune of others. On the other hand, something has to be done with things that are just abandoned in this way. Frankly, I prefer not to think about this aspect of the program and just enjoy the interpersonal conflict. This set contains the 19 episodes of the first season on three discs, but unfortunately A&E offers zero in the way of extras other than a Play All button. The HD version is only available as a download so far as I can tell, but the video quality on these discs is superb and frankly is almost as good as the HD feed of the program, so I don't feel like I'm missing much in the standard DVD version.